An advocacy group delivered letters from children to Gov. Doug Ducey’s office Friday to press its claim that the budget agreement between Ducey and GOP legislative leaders cuts too deeply. “I can tell you very clearly that there is a large gap between the values in this budget plan that legislators are looking at today and the aspirations, and dreams and questions and needs expressed by these children,” said Dana Wolfe Naimark, CEO of the Children’s Action Alliance. She said there was no immediate response from Ducey, and a reporter’s message left with Ducey’s press office wasn’t returned by mid-afternoon Friday. 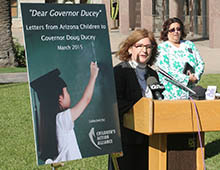 Wolfe Naimark said that while the students who wrote the letters featured in the book hadn’t seen Ducey’s budget plan the difference between what they need and what the new budget will give them is large. The subjects of the letters vary, with students focusing on topics they said meant the most to them and their families. Liliane, a fourth-grader at John Jacobs Elementary School in Phoenix, said her school is outdated and needs improvements to its bathrooms, playground equipment and classrooms. “Our school is 35 years old and we would like to improve our school facility,” her letter said. Mya, a fifth-grader at Quail Run Elementary School in Phoenix, suggested that Ducey visit her school so he can see for himself what’s needed. As the Legislature considered the budget proposal on Friday, Wolfe Naimark and others held a news conference to criticize the plan. Andrew Morrill, president of the Arizona Education Association, the state’s largest teachers union, said tax cuts proposed in the budget will do nothing to help the economy. “If tax cuts were the answer to building a strong Arizona economy, Arizona would certainly know it by now. We’ve been doing it for more than 20 years,” he said. Roger Freeman, president of Arizona School Administrators, said it’s clear from the proposed tax cuts that Ducey doesn’t want to provide more funding for schools. “I believe it is what the people of Arizona want. And certainly for us to be effective in educating kids it’s what we need to see happen in our public schools,” he said. Advocates used kids' letters to bolster their argument that a budget deal between Gov. 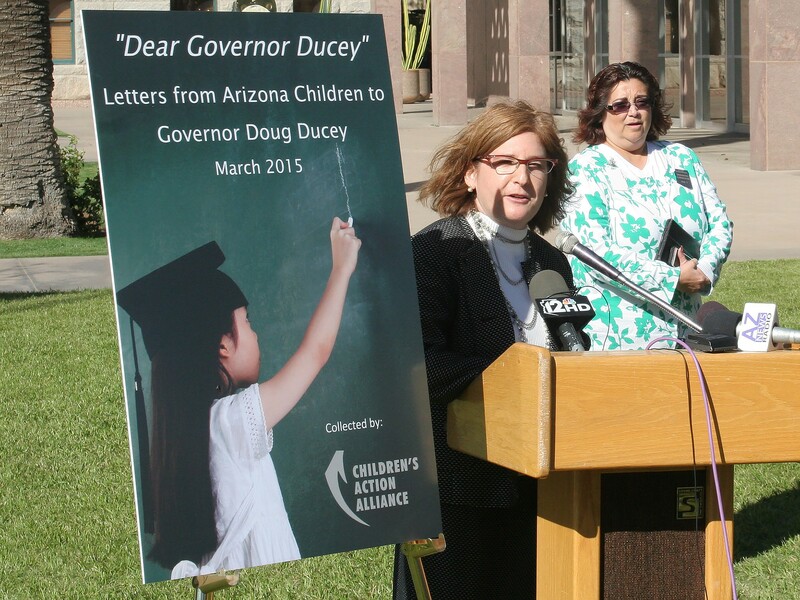 Doug Ducey and GOP legislative leaders is bad for Arizona's children. Dana Wolfe Naimark, CEO of the Children's Action Alliance, explains a book of kids’ letters her organization delivered Friday to Gov. Doug Ducey.